A former Tory candidate has pleaded guilty to a campaign of harassment against his Liberal Democrat rivals. Ian Oakley, who quit as a prospective parliamentary candidate in Watford last month, admitted five charges of criminal damage and two of harassment. Oakley, of Ryeland Close, West Drayton, west London, asked for 68 other offences to be taken into account. His case was adjourned until 16 September for psychiatric reports. He was warned custody would be an option. The Lib Dems have called on Tory leader David Cameron to hold an "urgent inquiry" into the procedures and activities of the Watford Conservative Party. St Albans Magistrates' Court was told Oakley had damaged property belonging to the Lib Dems and had harassed rivals Sal Brinton and Russell Willson. He slashed tyres and wrecked shutters at the Liberal Democrat headquarters in the town. He made silent phone calls to Ms Brinton between August 2006 and March this year, and sent her gay and lesbian magazines, the court was told. Letters addressed to "Sal Bitchton" were also sent to her workplace. Oakley's campaign against Mr Willson was mounted from February to May this year and included painting graffiti on his home, calling him a "perv". He also sent letters to him and his backers wrongly accusing Mr Willson of being a "child abuser". 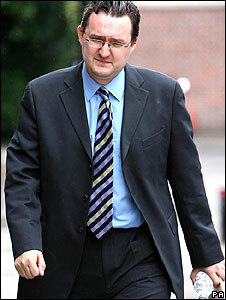 Donna Rayner, prosecuting, said Oakley had been driven by a "desire to change the political landscape in Watford". He also slashed tyres on cars belonging to councillors Peter Ray and Mark Watkin and smashed the rear light on a car owned by Nasreen Ajab using a hatchet and Stanley knife, she said. Oakley's fingerprints had been found on envelopes containing poison pen letters and CCTV had caught him in one of the graffiti attacks. Adjourning the case, Barry Northrop, chairman of magistrates, told Oakley the offences were "very, very serious indeed, so serious that custody would be an option". He said he had caused "great personal distress" to his victims and their families. "Both the harassment and the criminal damage offences were targeted very often to homes of the individuals involved and were vindictive in nature," he said. "By your own admission, this course of action was intimidatory." Oakley was granted bail until sentencing, on condition he does not contact a number of people named by the court. Ms Brinton, the Lib Dem parliamentary candidate for Watford, said she was pleased Oakley had pleaded guilty and was relieved "the nightmare of the last three years may finally be coming to an end. "This has been a traumatic period for all those who have suffered from his vile campaign to defame, intimidate and terrorise people, simply for expressing support for a political party," she said. Oakley, who attended court wearing a dark grey suit, spoke only to confirm his name and address and enter the guilty pleas. He had been the Conservatives' general election candidate for Watford, but resigned from the party on 19 July following his arrest. Edward Davey, the Lib Dem chairman of campaigns and communications, said he had written to Mr Cameron to find out why Watford Conservatives had "failed to investigate the matter properly and to ensure that such an appalling course of events is never repeated". He said: "This was a disgraceful and criminal campaign aimed at intimidating candidates and voters and subverting the democratic process." Labour MP Claire Ward managed to hold Watford by a slim majority of 1,148 over the Liberal Democrats in the 2005 general election. The constituency is one of the few areas in the UK where there is a three-way split in votes between the major parties, making it a target seat for both the Lib Dems and Conservatives.